India's next government needs a more clear-headed and self-assured foreign policy, particularly for addressing the insidious China challenge. The Dalai Lama recently told this newspaper that due to Chinese pressure, no Buddhist country, with the sole exception of the nominally Buddhist Japan, is now willing to grant him entry. China’s ability to browbeat smaller countries into submission, however, should not obscure the major new challenges it faces. The world’s longest-surviving autocracy turns 70 this year, with its future uncertain. This year also marks the 30th anniversary of the Tiananmen Massacre, which left at least 10,000 people dead. After more than a quarter century of phenomenal economic growth, China has entered a new era of uncertainty. China’s slowing economy, an international geopolitical pushback against its overweening ambitions, new trade disruptions and tariffs, and President Xi Jinping’s centralization of power have all contributed to a jittery mood among its elites. Add to the picture the flight of capital from a country that had amassed a mountain of foreign-exchange reserves by enjoying a surplus in its overall balance of payments. Not only is capital fleeing China but even wealthy Chinese – in an informal vote of no confidence in the Chinese system – are emigrating. Meanwhile, China has come under international pressure on multiple fronts – from its trade, investment and lending policies to its incarceration in “re-education camps” of more than a million Muslims from Xinjiang, a sprawling territory Mao Zedong annexed in 1949 just before gobbling up the buffer with India, Tibet. China’s free ride, which helped propel its rise, seems to be ending. Malaysia’s decision to scrap a $20-billion rail project is just the latest example of how Xi’s Belt and Road Initiative (BRI) is running into growing resistance. Even Pakistan, China’s client-state, has downsized, cancelled or eliminated some BRI projects. Meanwhile, a US-led pushback against China’s Huawei conglomerate has broadened from opposition to its participation in next-generation 5G wireless networks to a broader effort to restrict the use of Chinese technology over espionage concerns. It is China’s open disregard for international rules, however, that explains why it can count on few true strategic allies or reliable security partners. China’s lonely rise could become more pronounced with the newly restructured People’s Liberation Army (PLA) becoming less of an army and more of a power projection force, the majority of whose troops now are not from the army but from the other services, including the navy, air force, rocket force and the cyber warfare-oriented strategic support force. For China’s neighbours, the PLA’s restructuring foreshadows a more aggressive Chinese military approach of the kind already being witnessed in the South and East China seas and the Himalayas. In fact, the risk is that – just as Mao staged the 1962 invasion of India after his disastrous “Great Leap Forward” created the worst famine in modern world history – Xi’s mounting challenges at home and abroad could prompt him to divert attention through military aggression. Undeterred by the international pushback, however, Xi’s regime is still blending economic aggression, debt-trap diplomacy, territorial and maritime revisionism, influence operations and Orwellian tactics to advance unbridled ambitions. Chinese influence operations range from legitimate activities like lobbying to more covert or corrupting actions such as seeking to meddle in the domestic politics of democracies and sway their policy-relevant discourse. As Indian national elections approach, China has stepped up its influence operations in India. China has been emboldened by its remarkable success in Nepal, which has tilted toward Beijing, despite an open border underscoring its symbiotic relationship with India. On the first anniversary of Nepal’s communist government this weekend, it is important to remember that China played no mean role in the communists’ democratic ascension to power there. India, with its fragmented polity and fractious political divides, has become an important target of China’s efforts to buy access and influence and sway politics. These efforts have been aided by New Delhi’s feckless approach to Beijing, especially since the Wuhan summit. Moreover, by more than doubling its trade surplus with India to over $66 billion a year on the National Democratic Alliance government’s watch, Beijing has acquired deeper pockets for influence operations, which aim to help instil greater Indian caution and reluctance to openly challenge China. At a time when India is engrossed in electoral politics, including increasingly petty and bitter feuding, Beijing’s conduct is underlining its master plan for this country: It wants a weak and unwieldy Indian government to emerge from the elections. China’s culpability in the Pulwama massacre of Indian jawans is unmistakable. In keeping with its master plan, Beijing brazenly shields Pakistan’s export of terrorism, including blocking UN action against Pakistan-based terrorists like Masood Azhar. Indeed, China has long used militants to attack India’s weak points, including by originally training Naga and Mizo guerrillas and currently consorting with several northeast Indian insurgent leaders, some of them ensconced in Yunnan or Myanmar. If India is to safeguard its interests and expand its global footprint, its next government would need a more clear-headed and self-assured foreign policy, particularly for addressing the insidious China challenge. 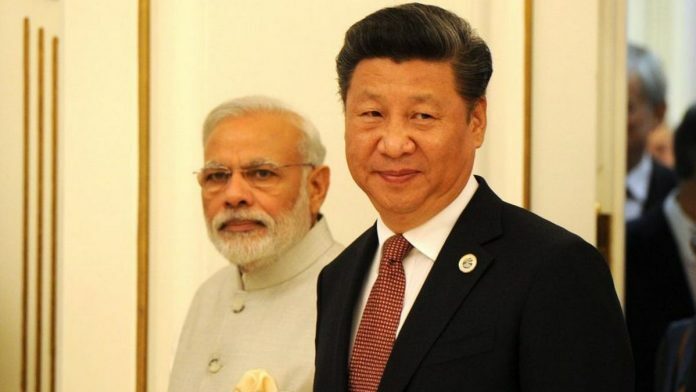 The author has missed the most critical factor in the matter of Indo-China relationship–that is the long cherished dream of Communist China to gulo India as a whole. Whatever the “next government” seeks to do through its foreign policy, it is impossible to bring about a ‘change of heart” in the communist China’s leadership, with the hone grown anti_national Left supporting g the ancient country. China cares two hoots for the relationship between the two ancient civilisations of the two countries or the infamous lotus eater’s pet slogan of “Hindi- Chini bhai bhai”. China must occupy India–that’s all. And the communists of India are too eager to make it possible. The author with a reputation of an “expert” belies the title of the article by devoting just the last para to Chins’a culpability for Pulwama. He has not provided a shred of evidence to connect China with this particular terror strike. As they say in Bollywood, China and Pakistan are an item. Two migraines, for the price of one. Not because we love them or have any illusions, but it would be in our own best interest to have a trilateral dialogue and find a more productive way to coexist.